If there’s one room in the house where you can be unencumbered by a million design rules, it’s a kid space. 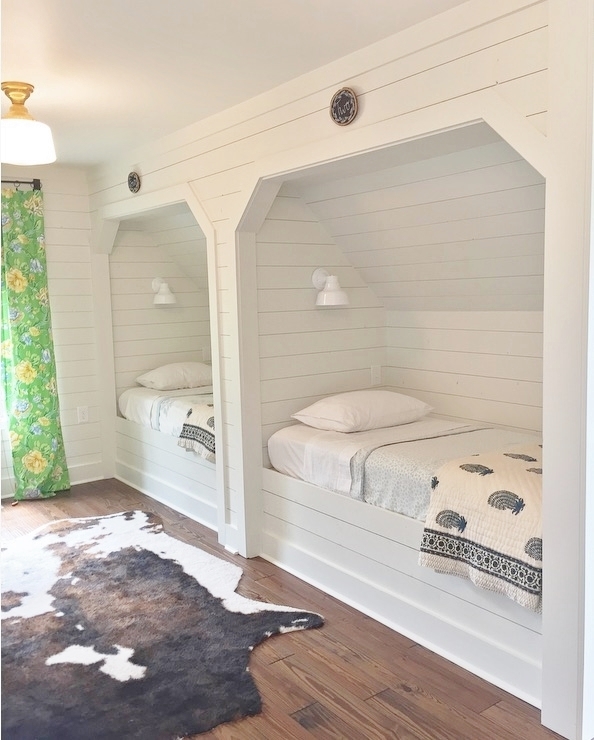 Bedrooms and bunkrooms occupied by children are often loaded with color, whimsy, and fun details you won’t find in other parts of the home. But don’t throw the design book out just yet. By following a few guidelines, you can create a space that not only satisfies your toddlers, but will also keep up as they enter those fun teenage years. Scroll on for some Pinterest-worthy pictures! 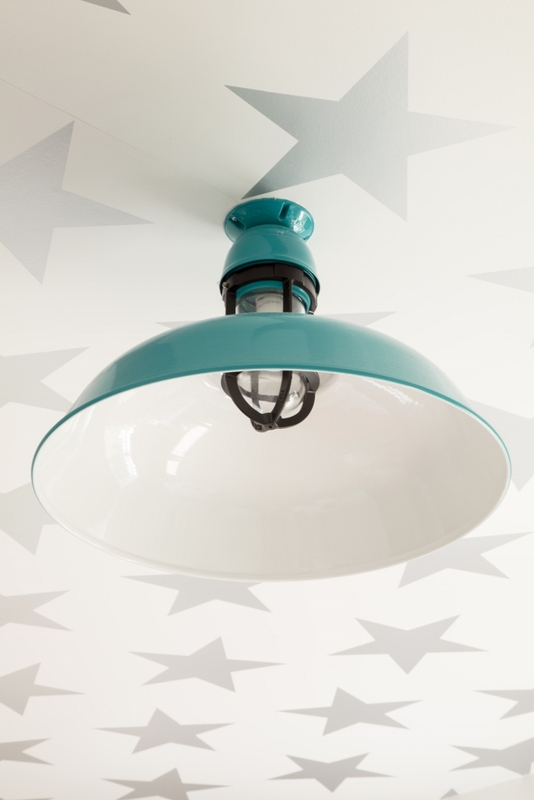 Designer Jamie Keskin lent her magic touch to a kid’s room by using star-covered wallpaper on the ceiling. Kids of all ages love lying in bed dreaming of faraway places, and this creative touch anchors the space. The center of the room features a 20″ Outback Flush Mount Pendant in beautiful Teal. Jamie loves the fun pop of color, and she chose Black for the guard finish for more contrast. 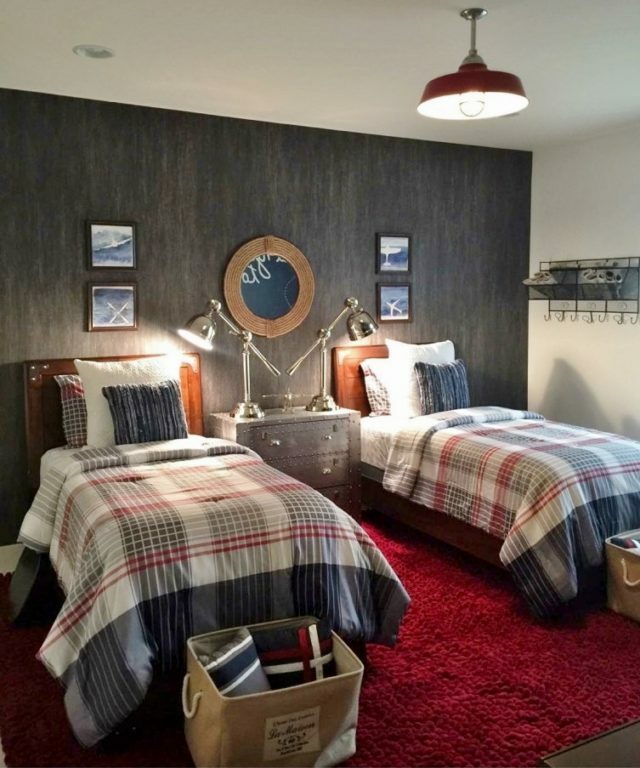 This boys’ room features table lamps for nighttime reading while an 18″ Rochester Vintage Industrial Stem Mount Pendant offers a wider span of light suitable for the space. With a red, white, and blue color palette, the Cherry Red finish on this porcelain enamel pendant pops from the white ceiling. The Galvanized stem and cast guard add the durable construction needed when boys are around! Although Jessica’s daughter really wanted a Disney Frozen room, she says her little girl got more excited as their renovation came together. Cozy bunk beds with plenty of pillows and reading lights won the youngster over. Accent pieces such as pillows and framed art can be easily switched out as kids grow. Jessica chose Streamline LED Industrial Guard Sconces because their South Texas home has plenty of windows and tends to get warm. The LED option helps keep the sleeping area cool. This homeowner built a loft with a second bed underneath then added unique items like the orchard ladder used to access the top bed. Each space has its own personal light — the Lovell Plug-In Wall Sconce — which frees up room on the nightstand. These American-made fixtures are customized with a White finish, brass arm, and blue-and-white cloth cord. If you’ve never experienced attic envy, fasten your seat belt. The space above was once a little-used room full of cobwebs, off-season clothes, and holiday decorations. But Sara envisioned so much more for her 1,000-square-foot attic. 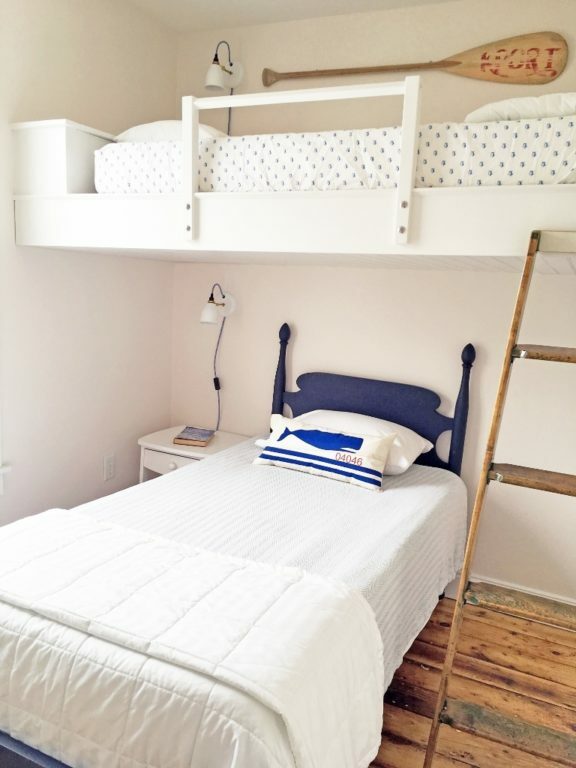 With the birth of her third child, she turned her attic into a guest room. 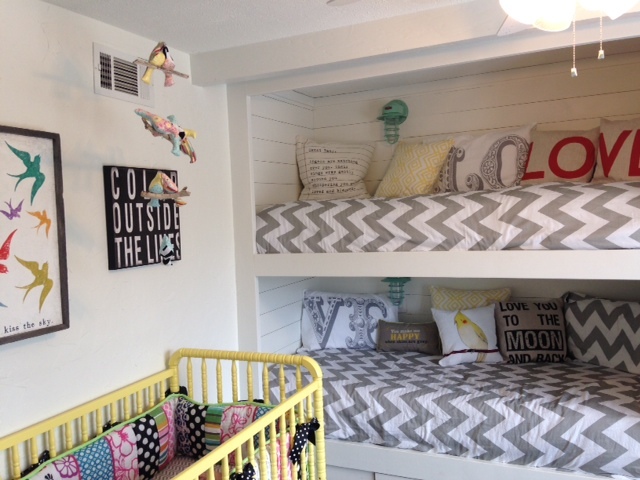 The built-in bunks provide sleeping space for guests both young and old. Two Bowie Wall Sconces give each guest their own personal reading light. 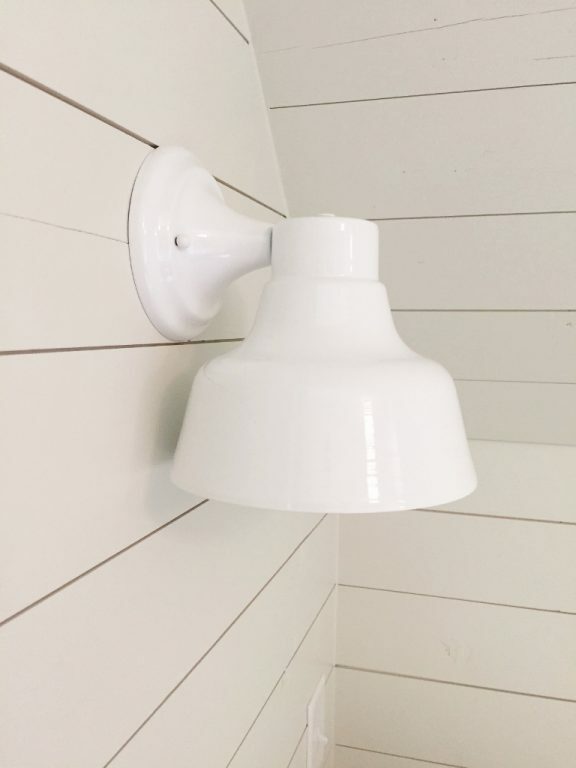 Sara customized these wall-hugging barn sconces with 8″ shades and a White finish to complement the walls. For more inspiration, click over to our Playrooms, Nurseries & Kids’ Bedrooms board on Pinterest!